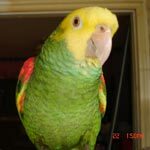 Parrot Forum • View topic - Encouraging flight? Hi, I'm new. I bought a sun conure at the end of August. He's about 11 months old now, and his feathers are still clipped from when he was at the pet store. I have a harness for when we leave the house, but I really wouldn't mind if he flew around inside. I have pretty well bird-proofed my home. I'm just wondering how it works. Will he teach himself to fly? Do I have to do something special to encourage him to do it? He can hop pretty well, but it doesn't seem like he's even trying to fly. My grandma had green cheek conures and I remember them trying to fly despite being clipped, but my bird just doesn't seem interested. I don't want him to miss out on "being a bird," so I'm choosing to let his feathers grow out and not clip them again. I would appreciate any advice, or let me know if this is a bad idea. I know not to have any ceiling fans on, hot surfaces, large pools of water, etc when he's out. I actually only cage him if I DO plan on having anything on that could hurt him. He's mostly content with being on his playstand or in my shirt. If a child is not helped to learn to walk then it will learn on it's own. It is just natural for them. You don't need to hurry him. He will know when he wants to fly. I agree with Liz, wait and see. You've had him for a very short time and he is not even out of his honeymoon period yet so don't force (or ask] him to do anything. In time and if everything goes according to plan, he will start gliding down, then he will sustain horizontal flight and, once he gets his primaries back, he will achieve vertical flight [when they take off up from the floor]. This is if he was allowed to fledge properly when he was a baby - if he wasn't, you might have to exercise his wings and maybe even make him fly a bit but it's too early to tell and too early in your relationship to try anything at this point in time. Okay, thanks for the advice. I really love him no matter what he does. I just want to help him have the best life he can. I went to the pet store for food for my little sister's new rabbit and he was pretty much following me around as best he could from the inside of his habitat, doing his "wolf whistle" and being adorable. The employees said he'd been there for months, with someone purchasing and returning him in between because he was so loud. He's only loud if I leave the room and don't whistle back when he calls me, though. I think whoever bought him first thought they could just leave him in his cage. Other than me leaving the room, the most noise he makes is whistling and hooting on his shower perch. He loves shower time. And I don't mind that because I sing in the shower, too. Now, a word of caution: please make sure he bathes in cold water. Birds feathers were not designed by nature to be exposed to warm water so, when they are, the natural oils that protect them are stripped [as well as from their skin] and this could lead to feather destruction behavior so be careful about that. They actually like cold water and as long as the room is warm and the bath takes place in the morning or at noon, it's fine [this is because their entire plumage needs to be completely dry by the time they go to bed which takes hours and hours because of the double layer of feathers they have]. It is actually really important to teach pet birds to fly in a suitable way. If left to figuring it out on their own it will be a combination of bumping into things and landing on places you don't want the parrots to learn to go. By training the parrot to fly to parrot perches, stands, and ok places, you are inadvertently discouraging the parrot from going anywhere else once it becomes more independent. You can't teach them where not to go but you can teach them where they should go and that's why training is so helpful. You can already start now but without the flight portion. Target train the parrot to walk off of your hand and onto places that you want it to go (parrot tree, training perch, cage, chair back, etc). Target it to walk from those places back onto your hand as well. It will get used to going there and feel safe there.